Mount Ord, at the center of the Mazatzal Mountains, is an island of pine surrounded by brushy hills, near Sunflower. It has dodged two major wildfires in the past several years (the Willow and the Edge Complex), probably as a result of the extensive prescribed burns that have been done on this mountain to protect the communication towers on top. I was wanting to do a hike on Mt. Ord and do some exploring on its pine covered slopes, but there are no trails up there. 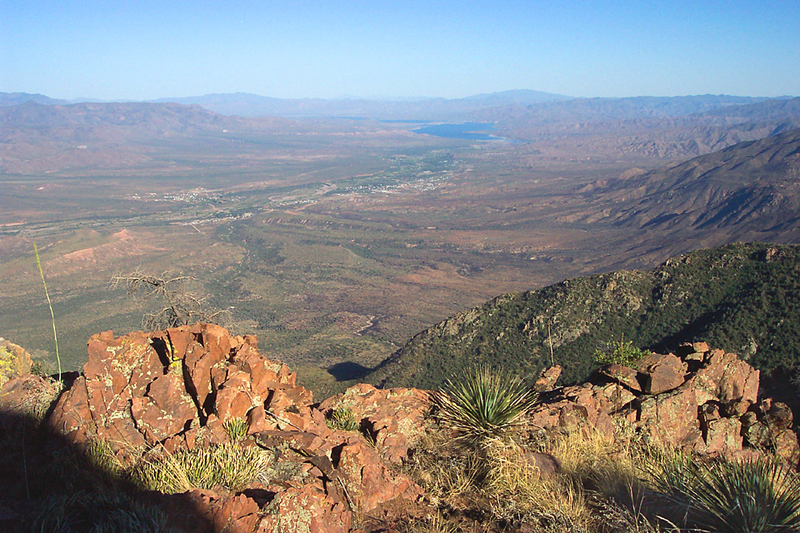 Following the eastern ridge of the mountain out to an overlook of Tonto Basin looked like it might make a good hike. After driving up the mountain on a summer’s afternoon, I parked at the top of Oak Spring Canyon on the Mt. Ord road, and started east. I hiked downhill a short distance to a flat saddle area between Oak Spring Canyon and Sycamore Canyon. On the south side of the saddle there were several old mine pits. A well defined cow path led north from the flat area, but my destination was the ridge. From the saddle I continued east, following the ridge, through an area scorched from a prescribed burn gone wild. The burn had cleared out a lot of the oak brush along this ridge, making for easier cross-country travel. 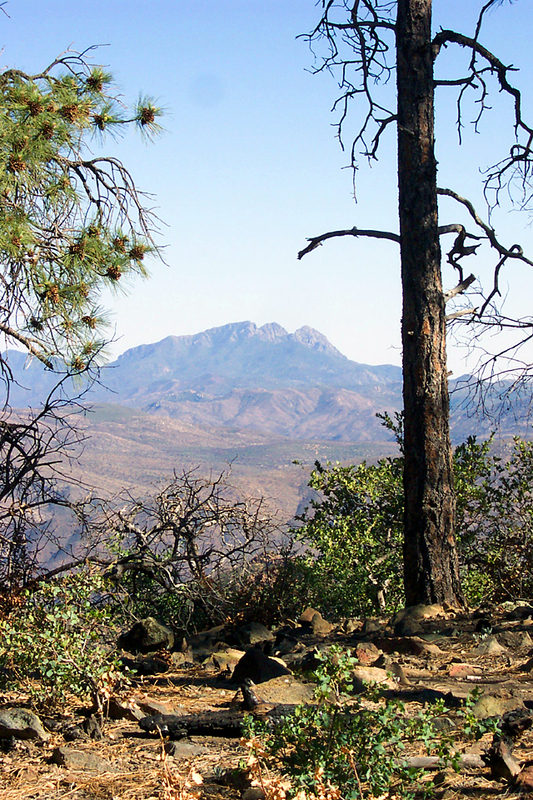 Unobstructed views to the south provided a view of Four Peaks, the Mt. Ord fire tower, and the flat country around the top of the Park Trail. The faint trail I had been following soon disappeared completely. I continued hiking along the relatively flat ridge, weaving around trees and brush, building occasional rock cairns, and enjoying the views of Tonto Basin and the Sierra Anchas. At the halfway point, the ridgeline split, and I opted for the north ridge. After turning northeast, the ponderosa pines and oaks gave way to junipers and pinyons. Arriving at the base of a rocky butte of pink granite, I noticed several small pieces of broken pottery. A more thorough investigation of the area failed to reveal any more artifacts or ruins. I climbed up the rocky granite outcrop hoping to see a hilltop fortress, but there was none. 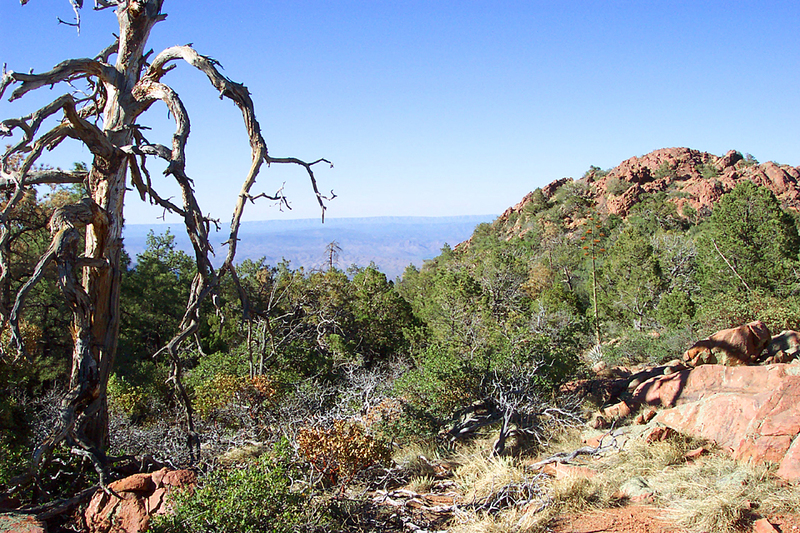 There were however great views of the northern Mazatzal Mountains, the Mogollon Rim, the Sierra Anchas, Tonto Basin, and Roosevelt Lake. While resting atop this rocky mound, I watched what I guessed to be a hawk gliding through the air, with nothing below it but unforgiving cliffs. Having gone out as far as I could on the ridge without hitting nearly vertical mountainsides, I began making my way back to the road. On the way back, I contoured along the forested slopes below the ridgeline, where I discovered a grove of bigtooth maple trees, and an ancient overgrown mine. This brought to mind my having read somewhere about a legend of a lost mine, somewhere on the slopes of Mt. Ord. Occasional openings in the tree cover provided some views of Tonto Creek far below. I arrived back at my truck just after sunset, after having spent an enjoyable afternoon of off-trail exploration on Mt. Ord. 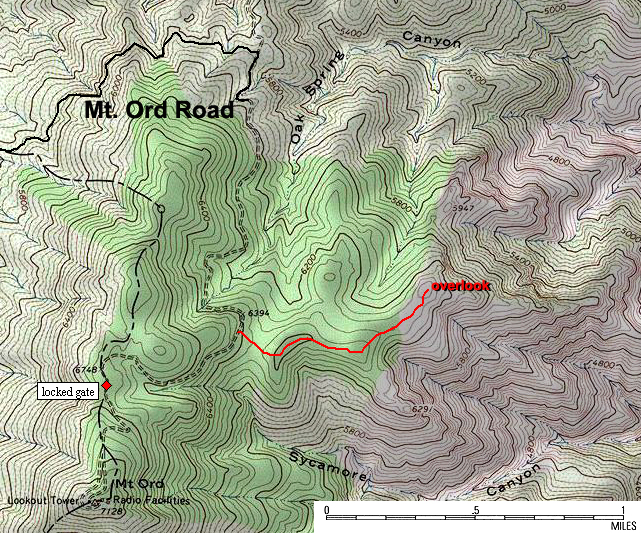 This is an off-trail hike; route finding skills are helpful. From Phoenix, take state highway 87 east to the signed turnoff for Mt. Ord Road, about 0.5 miles north of mile post 222 (near Maricopa/ Gila County line). Turn right, and follow Mt. Ord Road/ forest road 626 about 5.3 miles from highway 87, just past a cattle guard. (This is about 0.67 miles before the Mt. Ord Road ends at a locked gate. Park where you can find room, then head downhill/east to the saddle (see topo map included above).